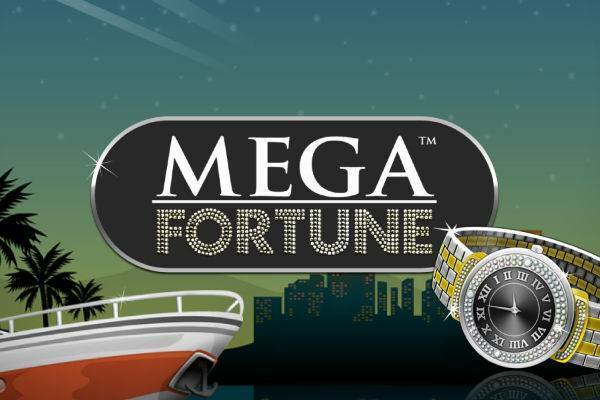 If you haven’t heard by now, Mega Fortune is one of the biggest progressive jackpots. 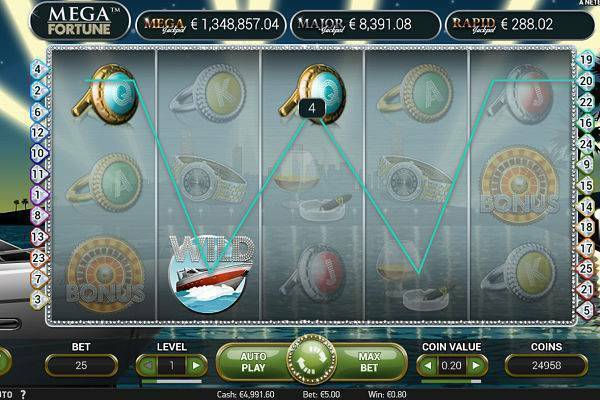 With 5 reels and 25 paylines, this shiny slot from NetEnt is all about the glitzy life with champagne, whiskey, yachts. The luxury has extended into real life for some lucky players, as the jackpot averages at roughly £3.5 million and has often paid out well above that mark, even setting a record in 2013 for its a gigantic payout of £15.8 million pounds. In addition to the Mega jackpot, there are 2 smaller ones, plus some bonus features to keep the cash flowing in even you don’t hit millionaire status. Try your luck with Mega Fortune at these vetted online casinos. To set your bet size in Mega Fortune, first choose your Coin Value, which can be as little as £0.01. Then in Bet Lines, set the number of lines you want to bet on, and in Bet Level you can set the number of coins you want to bet on per line. The absolute minimum bet can be just a penny a spin, but our advice is always to bet on the maximum number of lines, in this case 25. This will increase your chances of winning and it would only cost £0.25 per spin. Once your Bet Size is set, you can press the Spin button. If at any point you want to quickly up your bet size, Max Bet will bring your bet to the maximum number of lines at the highest bet level, but will not touch your Coin Value. To win the Mega Fortune jackpot, this is what needs to happen. Get into the Bonus game by spinning 3 or more Bonus symbols (the Wheel). They need to be next to each other going from left to right and on an active payline, which is the one good reason why you really should bet on all paylines in this game. Then in the Bonus game, you’ll see a big wheel, comprised of 3 layers, each with jackpots that grow in size – Rapid, Major and Mega, with Rapid being the smallest and Mega being the largest. The first layer contains cash prizes and arrows. Give this first wheel a spin and hope you get an arrow, which will let you progress to the next wheel. If it’s the cash prize, then those coins are yours and you’ll go back to the base game. If you get to the 2nd wheel, you’ll see bigger cash prizes, arrows, and Rapid. If you get Rapid, you’ll collect the Rapid jackpot and go back to the base game, so again, you really want to hope for an arrow. At the 3rd wheel, it’s the same deal, except that you can win the bigger Major jackpot. If you get an arrow on the 3rd wheel, then congratulations are in order as the ultimate Mega jackpot is yours! Mega Fortune is most famous for the Bonus Wheel and jackpot prize, but still there are some additional features that can deliver some good wins. Scatter Free Spins: 3 or more Scatter symbols (the Champagne) will trigger a round of free spins. Before the free spins start, there’s a pick me feature where you will uncover the number of free spins you’ll get, along with the multiplier (up to a 5x multiplier) that will be added to your wins. During free spins, you only need 2 scatters to re-trigger this feature. Yacht Wild: The yacht is the highest paying symbol and is also the Wild that can substitute all the other symbols to form a winning payline (with the exception of the Scatter and Bonus symbols). NetEnt is synonymous with high production values, and Mega Fortune is no exception. The slot is cleanly designed with the shine of the luxurious life. The audio is easy and good company. The reels spin smoothly, and the Bonus Wheel is swanky and glitters as you try your hand at winning a life-changing jackpot – or even just a few comfortable grand. 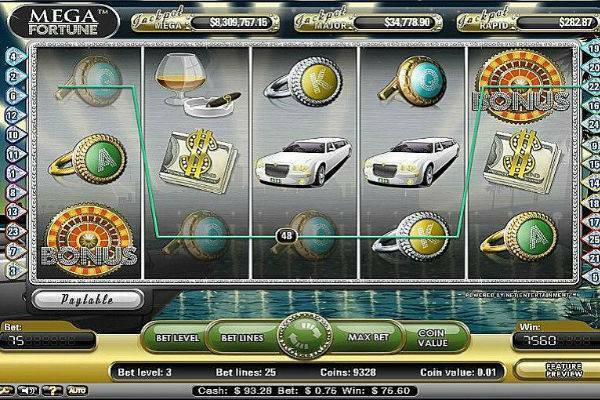 Mega Fortune is one of the biggest progressive jackpots out there, and more than a few winners have gotten lucky with this game. The wilds, free spins and multipliers add to the excitement, and with an RTP of 96.4%, this is a pretty solid slot with reasonable wins. While understandably, everyone is aiming for that ultimate Mega jackpot, the smaller jackpots in the game are also known to deliver some very handsome, 4 or 5 digit wins. Give the reels, and hopefully also the Bonus Wheel, a spin and see how lucky you are!